Paramount Pictures has released the first trailer for Dora and the Lost City of Gold, a live-action adaptation of the hit animated series Dora the Explorer. Stars Isabela Moner (Dora), Michael Pena (Dora's Father) and Eugenio Derbez (Alejandro Guttierez) introduced the trailer on stage during Nickelodeon's Kids Choice Awards on Sunday night. It was also announced on Thursday that Danny Trejo will provide the voice of Dora's best friend, a monkey named Boots. 'But exploring is not a game, and you don't look before you leap,' he adds, paired perfectly with footage of Dora actually taking a big leap and coming up way short. She looks up from her fall at her monkey Boots, telling her beloved pet that she's OK after her fall. They have discovered, 'an ancient city made of gold,' and they are going to prove it, but they can't bring Dora with them. Instead, she's going to live with her cousin Diego (Jeffrey Wahlberg), with her father trying to explain what a rave is, badly. The trailer picks up at the airport, with Dora reuniting with her cousin Diego, who is so 'skinny and tall,' while Diego comments on how 'energetic' she is. She is next seen getting off the school bus telling herself to 'be herself,' before she gets in a bit of a mishap, as her backpack gets stuck in the bus door. During a school field trip, Dora is kidnapped by the villainous Powell (Temuera Morrison), who wants her to help them find her parents and the lost city of gold. The trailer ends with a number of random shots including Boots reuniting with Dora and their whole crew tumbling down a jungle hill in a hollowed out log. 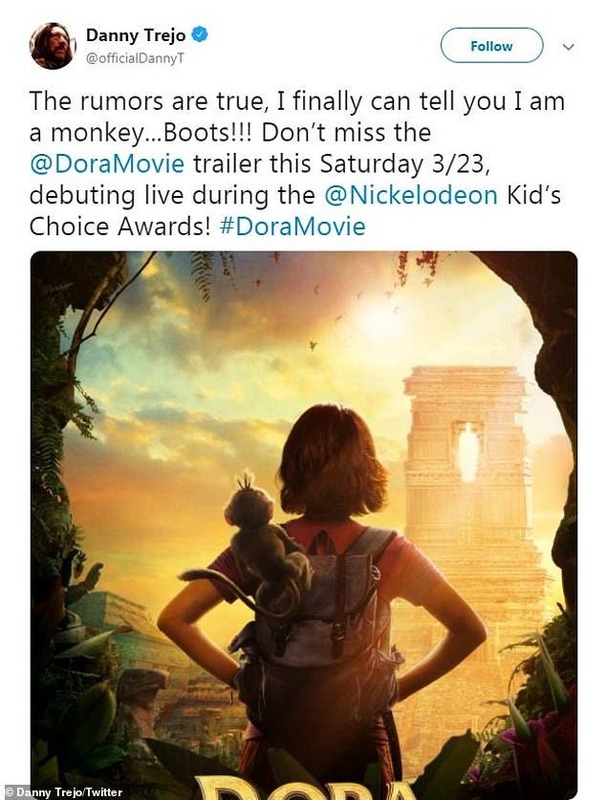 Dora and the Lost City of Gold hits theaters August 2 from Paramount Pictures.